the Three Levels of practice and Twelve Animation 'tendencies'. Collectively this is no more than an extended description of the style. It also represents an inability of 'students' to unravel their 'teachers' narrative as both story telling, collective naming, and 'just passing alone' what he was told without any understanding nor attempt at exploring why? There is a possibility that various similarly branches of related exercises have been passed along and that their differing names joined; this in itself does not verify the stories. The common aka, also known as name, is 水拳 shui3 chuan2, 'water boxing'. which is too often used as a synonym ...which it should not be and which seems more correct for an early Shanghai version. Note: 勢 shi, innate 'power-tendency', appears in the Lu-hong 8-shi boxing name and in other boxing arts. I think that 勢拳 would be better than to use the unclear 内 nei for internal. 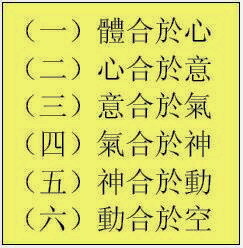 the 八法 bafa, eight exercise methods. and of much philosophical and symbolic depth. Similar codes for other martial arts exist and parts are similar. Its' origins are unclear. In effect, they could be called terse 'lecture' notes as 'memory clues'. The 'said' author is always given as Li, 'East-wind' [ Li Dong-feng] with the locative claim that 撰于鹿邑 隱山, 'composed at' 'Lu district' 'yin-shan, hidden mountain' 隱山. As much as the verses are 'claimed' as related, ...they are for the most part redundant and likely dedacted by later writers. In their favor, it can be said that they do follow the numerical verse patterns as used by Song to Ming Dynasties, usually as 3-word verse, 4-word verse,..etc. They, however do not offer much beyond the core verses LHBF; also there existence does not verify claims that they were scribed in the Song Dynasty. 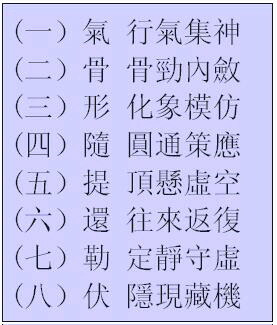 The Form Names, as 66 verses, [ 六十六 ] of 4 character-concepts each, is of greater use; it demonstrates a knowledge of the 'scholarly' four-arts and an adeptness of twisting various idioms and homonyms to present or to conceal. To the above documents, attention can also be focused on 簡介 jiǎn jiè or school-origins summary and introductions. The start from Chen Bo is the most doubtful, but the modern history from the 1900's onward is well documented. There are also suplementary verses to further explain obscure, needed aspects; these are not part of the traditional LHBF canon, but do present alternative and often simplified viewpoints. The exercise form series of Nanjing LHBF, as it is given, is also a teaching tome. As it has come down historically, itself with little explanation of its' origins, it consists of 66 four character strings, these are grouped according to the exercise series [thus 5+ each on the average] and the entire listing divided into two parts of 33 lines each, thus a first and a second half. None go into the multiple common idioms that some of the 4-character strings express nor to they go into the often allusion to similar hand motion themes expressed in Chinese Qin 'zither' poems and music. A common expression is to pluck at the stars, plucking strings as restricted by the 'stars' of the Qin. This opens up a reverse way to view the form names and intents: from Qin classic music to martial expression. [ http://silkqin.com/ ] Chinese IMA often applied weaving and twisting motions, these are similarly discribed in Qin. The composition of poems with numerical code, to formulate ideological principles in a brief, but complete teaching verses, is common at any time and for any subject through out chinese history. The often given origins of these verses is that they are from the taoist-buddhist sage Chen Bo Tuan from Mt.Hua in Shensi Province [this is unproven]. > 'attracted by a light coming from a cave. It is also a presumption that the 5-word 'secret' was a 'departing' wisdom for his first protege Song Yuan-tong. Both the 6x8-verses and the 5-word verses have been translated into english. [ Foxx for the 6x8 verses and Paul Dillon for the 5-word secret.] The 5-word 'secret' or 'songs' as first translated from Chinese to English by teacher John ChungLi, are available. (2) their terseness is intentional, first like 'lecturers' notes they rely on single word brevity which only the addept understood and secondly, to obscure a secondary or tertiary meaning from all others; the verses are in a sense, an 'alchemical' test of the students' insightfulness and of the teachers intent to obscure a deeper idea. An insight is most of the ideo-pictograms chosen are composed of two parts (which interplay into deeper concepts) and that most of the characters are divisable into three categories: 3 chi's, 3 shen-spirits, 3-jings. (3) It also can be said, the poem-verses are not unique, and that as written, a terse alternative would be: 'to obtain unity'...'use a universal method' Although there now exists about (4) English language offerings of the form name each is unremarkable and similar. The only indepth, sholarly approach to deciphering and translating the teaching poem into english remains that previously offered by practitioner-author Khan Foxx. Copies are only available by direct request. with the Spirit-nexus as the dominant leader. san-yi, the three-ideas, san-qi ( the three-sources of qi-flow), etc. To read through without perceiving the diversity of each aspect is to only understand the top vineer of this teaching. Also, many 'students' and their 'teachers' tend to be dogmatic in the use of the 'three treasures' whose use will not unlock this verse. The verse does have segments, but it does not progress by 'pushing' the development of lower to higher aspects. There needs to be a 'leader' to pull the aspects into order to empower the leading element, the spirit; without espirit...impetus, there is no unity to the cause. Implementing 'mind', 'feelings', or 'intuition' only results in failure. Rather than track through the verse as: ..this with that yields...thus, etc etc. The seven aspects are unified via six couplets.. yielding a resultant of unity (1). This is simple 'philosophical' arithmetics. The 'shen' or esprit of spirit pulls the chains advance. Wu Yi-hui; he would have likely been chosen to succeed Wu, but was imprisioned for his traditional practice of marital exercise by Red China. a movement is not considered complete. First Internal Harmony : Body and Heart. (not the organ,but spiritual strength). Second Internal Harmony : Mind and Heart. body you must build up the feeling by practicing it over and over again. By practicing you build confidence. Third Internal Harmony: Mind and Chi (energy or oxygen). then you can move without hesitation. The body and breathing(chi) will move naturally and automatically without the mind. Four Internal Harmony: Chi and Spirit ( heighten awareness). higher level(very fast blood circulation which carries the oxygen or chi throughout the body). Fifth Internal Harmony: Spirit Movement. the mind which will instantly react and power will automatically follow. (not blankness of the mind but clarity and openess, ready for any experience to arise beyond presetting or calculating something to happen or anticipating something to happen) When you have the benefits of the first five harmonies, then you will know how to react. You won't need to focus (calculate) on technique or anything else, just react. The real meaning or technique is to move without thinking. This is what Zen Buddhist practitioners call No-Mind (the mind free of conceptual idea, spontaneous fully aware and open to all experiences). motion. When your body moves in harmony or as one unit you have speed which translate into power. ...trains the coordination of arms and legs, shoulders and hips, elbows and knees, so one can attain a unity of body mechanics. This is also viewed as the 9 joints. The three joints of the body are in the lower spine the middle of the back and the neck. Move from spine, to the back, to the neck. Second External Harmony: Arm Joints Move as One. The three arm joints move from the shoulder, to the elbow, to the wrists.Third External Harmony: Leg Joints Move as One.The three leg jointsmove from hip, to the knee, to the ankle. Fourth External Harmony: Hand and Foot. The hands and feet move together as one unit. Fifth External Harmony: Elbow and Knee. The elbows and knees move together as one unit. Sixth External Harmony: Shoulder and Hip. The shoulders and hips move together as one unit. To summarize: All main joints (call root joints, shoulder, hip, and lower spine) must start together and stop together in harmony with each other. NOTE: the same 'joints above align with the joints below' is used in Yi-chuan. 'The LHPF style and all the internal styles of Chinese martial arts are concerned about the body moving as one unit, and only way it can move this way is that all the joints of the body must move together in a coordinated fashion. Masters notice that there are nine joints in the whole body. There are three joints in the trunk of the body, ... the lower spine, the middle of the back and the neck. There are three joints in the arm, which are the shoulder, elbow, and wrist. There are three joints in the leg, which are the hip, knee, and the ankle. These 3 sets of joints total to 9 joints. It is these joints that must move in harmony or coordinated fashion. 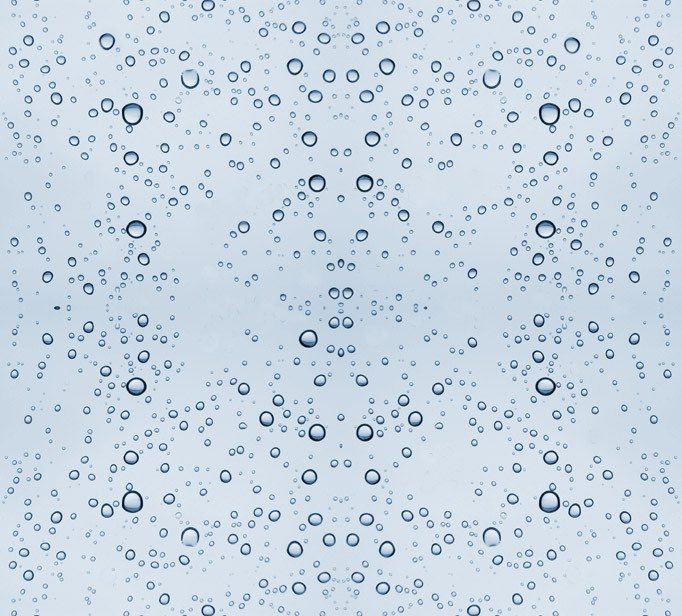 The nine-joints dynamically linked as one has been viewed and taught as the principle of the Six External Harmonys; of course this is starting from the outside to the inside and working piece by piece intending to achieve balance. NOTE: This teaching is unlikely from the LHPF-school, but is more a part of the BaGua-school teaching. 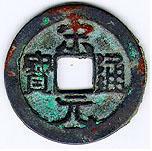 The 'Six Harmonys' thus have two aspects: outer and inner.